Thieves Essential Oil Household Cleaner – Go Green! Go Green and Chem Free! Thieves Essential Oil Household Cleaner contains essential oils that are purifying and cleansing. It is made from the Thieves oil blend that everyone loves so much! Although, I use it to clean my house, there are so many other uses as well. I love to use it as laundry detergent especially for the dog and horse blankets; and my towels! Or use Thieves Natural Laundry Detergent! This is an easy reference guide for Thieves Essential Oil Household Cleaner. It will tell you how to use your product and what to use it for. It will also provide you with some fun tips and testimonials! 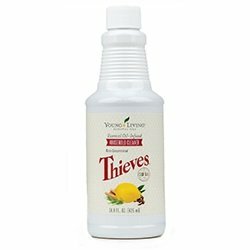 There are several natural ingredients as well as five therapeutic grade essential oils in Thieves Cleaner. Sodium Methyl 2-Sulfolaurate and Disodium 2-Sulfolaurate are natural plant based surfactants that do not raise any health concerns. There are no restrictions and/or warnings about these compounds! Yea! What are the Documented Uses for Thieves Essential Oil Household Cleaner? Cleaning, deodorizing, degreasing, dishwasher detergent, floors, laundry, mildew, oven, sanitizing and windows. At the barn use it to clean buckets, fly spray systems, and power wash your trailer. Dishwasher: Add 1 capful to the bottom of the dishwasher. Floors: Add 1 capful to 6 to 6 ½ cups water (depending on what is needed). Carpet: Add 1 capful to 6 to 6 ½ cups water (depending on what is needed). Washing Machine/Laundry: Add 1-3 capfuls depending on the size of the load; and what you are washing of course! Or try NEW Thieves Laundry Soap! Watch this video to get some more ideas for windows, carpets and scrubs! Can this oil be used for Animals? Yes, clean the pet bowls and the horse buckets with Thieves Cleaner. It is amazing how much longer they will stay clear of crud, especially at the barn! What are the Safety Precautions for Thieves Essential Oil Household Cleaner? No contraindications! There is a whole line of Thieves products that are awesome! I use them all! Thieves Essential Oil, Spray, Thieves Toothpaste, and Thieves Fresh Essence Mouthwash! are a few, besides the wonderful Thieves Essential Oil Blend. And now, NEW Thieves Laundry Soap and Thieves Fruit and Vegetable Rinse and Wash! Want to Purchase Thieves Household Cleaner? Want to Write Your Own Experience about Thieves Household Cleaner?